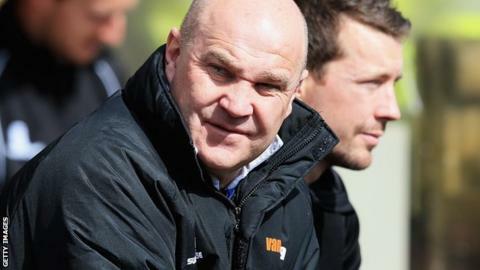 Eastleigh manager Richard Hill admits he has little idea what team he can name for his side's trip to Altrincham. Injuries and a sickness bug have decimated the Spitfires squad, leaving as many as eight players unavailable. Eastleigh have lost back-to-back matches for the first time under Hill's management after National League defeats against Barrow and Gateshead. "I really, really don't know where we'll be with which side I can play at Altrincham," he told BBC Radio Solent. "I'm going to have to play players who are half fit and others who aren't in the best physical condition either." Eastleigh's list of absentees is headed by the suspended Ben Strevens after the midfielder was sent off against Gateshead for an incident in the tunnel at half-time. Goalkeepers Michael Poke and Ross Flitney are long-term injury absentees, while Andy Drury, Jamie Turley, Jack Midson and Dan Harding have all picked up knocks in training. Paul Reid has an infection in his leg which has required antibiotics and the defender may be admitted to hospital if his condition fails to improve. Hill is reluctant to use the loan market to help his crisis. "You can't just use the loan system to sign players just so you can fulfil a fixture," he said. "You have to sign the player for a month minimum, pay the wages. It has to be to strengthen the side."